I’ve an addiction to cookery books and recipes, so many wonderful different things to create. I love books too like this which feature a snippet of life in another culture, which give an insight into a different daily life. Right now when I’m writing this it’s January in the UK, a cold, frosty day but reading this book transports me into a place where the sun is shining and I can smell spices and blossoms. This book had me at pomegranates, cinnamon and lamb. Three things I adore. Pomegranates are magical, I used to watch nan opening them, picking out gorgeous, rich coloured and perfectly shapes seeds, like little crystals….even now I feel a frisson of that magic when I peel one ( and there’s a great tip on how to do that easily here). My daughter has been a vegetarian for most of her life now – she was nine when she decided no killing for her food, so we’ve grown up looking out for recipes she can enjoy and there are some fabulous ones here, different takes on the usual hummus, dhal and falafel that sound fresh and fun. Recipes to be enjoyed by non meat eaters and meat eaters alike. There’s so much to enjoy about this book and for many of the recipes the ingredients are ones that most people will have in their cupboards though some will need to be found through specialist outlets such as the pomegranate syrup. I’ve got this book on kindle for review, and the pictures in the kindle fire are inspirational, but like all non fiction books I think its better in conventional print format. 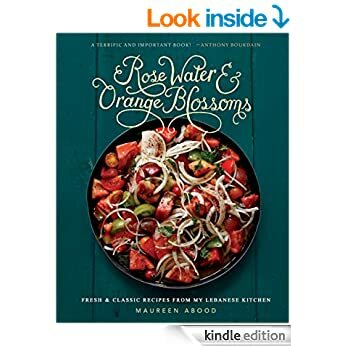 Its not easy to flick through kindle to find recipes, and it doesn’t help when they contain something which is given “on page 29” for example, when the kindle pages aren’t numbered but just go in locations. Maybe that will be changed in the final version though. Its a wonderful read, for the story of the authors life as much as for the recipes, the little snippets she reveals of her own upbringing – I love reading things like that, it makes everything so much more real. .
Stars: Five, if you love rich, lush, easy recipes and tales of other people’s lifestyles this is the book for you.